I recently realized I am THAT lady. The one I’ve certainly felt badly for, but banned from my brain because I never thought I would be her. This was the moment of realization: I was walking home from work, and I dropped my hair elastic. To retrieve or not retrieve? I’d really like to tie my hair up. I’m grossed out by other people’s hair ties on the ground. Like, seriously, you don’t notice when all of a sudden your hair springs loose? I don’t want to be a litterbug. The ground is really far away. I did not retrieve my hair elastic. I am a litterbug. As you can imagine, I’ve also been a bit of a disaster in the kitchen. 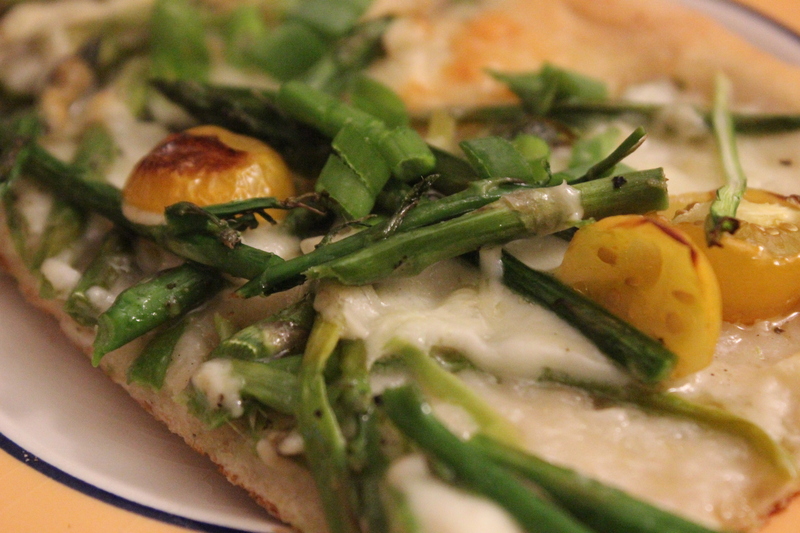 However, I was very proud of myself when I looked in the fridge about a week ago and realized I could basically recreate Deb Perelman’s shaved asparagus pizza (which I attempted here before) from things already in my fridge. Even better: all ingredients were within easy reach & didn’t require bending down. Some liberties, of course, were taken. 2 eggs – you’re going to poach these, & it will be awesome. I find Alton’s instructions turn out the most consistently well-cooked eggs. “Shave” the asparagus by holding by their (untrimmed) ends against a flat cutting board and running a sharp vegetable peeler across the spear. I found that using a cheese slicer works best. Repeat until you have a big pile of asparagus shavings, and then toss them in a small bowl with the onions, olive oil, Balsamic, lemon juice, and a pinch each salt, pepper, and crushed red pepper. Roll out the pizza dough on a lightly floured surface; sprinkle a bit of the flour on the bottom of your baking sheet and then transfer the dough to the sheet. Spread the ricotta lightly over the dough, top with asparagus and onion mixture. Drizzle with a little olive oil if you like, a sprinkle of Parmesan cheese, and then pop the pizza in the oven for 10-15 minutes, or until edges are browned and the cheese is bubbly. Top with a poached egg and serve immediately. Yup, we’ll be having more of this in the future. Tomorrow, Husband and I are jetting off on a very big vacation. For me, vacation means eating, drinking, and eating some more. Husband is a little more taken with hiking and outdoor things. However. This vacation is my kind of vacation. Destination: London and Paris. In other words, by this time tomorrow, I will be chowing SO MANY baguettes. (OK, to be technical, by this time tomorrow I will be drinking wine courtesy of Virgin Airlines. But I digress). 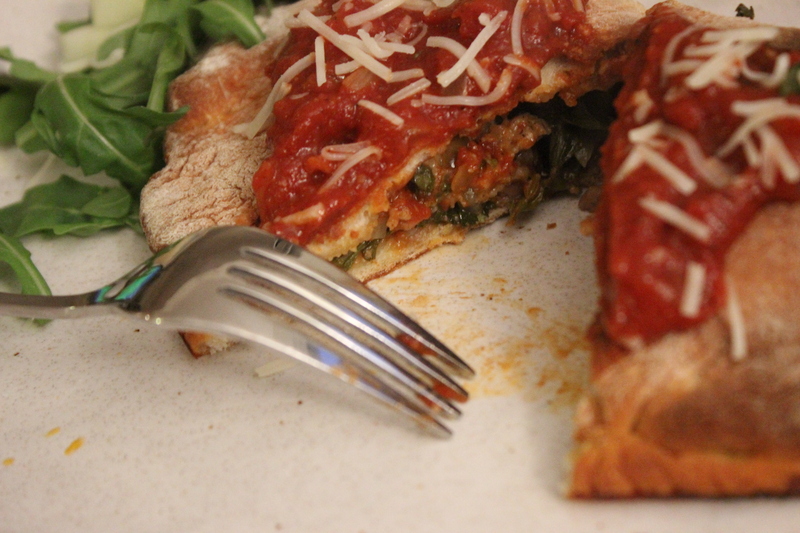 Of course, we had to practice our eating, so last night, I made these calzones. Just to forewarn: this is quite an endeavor – almost two hours. But this recipe makes so many that unless you’re a member of the Duggar clan (YIKES), you’ll have leftovers, which you can freeze. Which we have, and will eat the second we get off our return flight to DC. Heat a medium saucepan over medium heat and add olive oil. Add half of the diced onion, cook down a few minutes before adding garlic and tomato paste. Cook down another few minutes and add tomato, salt, pepper, crushed red pepper, and sugar. Stir together and cook for about ten minutes. Add basil and thyme and keep the sauce warm over low heat. As the sauce cooks, prepare your filling. Heat a large skillet over medium heat, add olive oil and the other half of your diced onion. Cook down a few minutes and add bell pepper, salt, pepper and some crushed red pepper (after all, we like it spicy around here). Cook for a few minutes before removing sausage from casings; make sure to break it up in the pan. Cook until the meat is completely brown. Divide your (room temp!) dough into eight sections and roll each out on a lightly floured surface – so they’re about 6 inches across and as close to round as they’ll get. Let’s be honest: this is the hardest step. Because my kitchen is tiny, I found it helpful to layer the rolled out rounds on a plate between sheets of parchment paper. 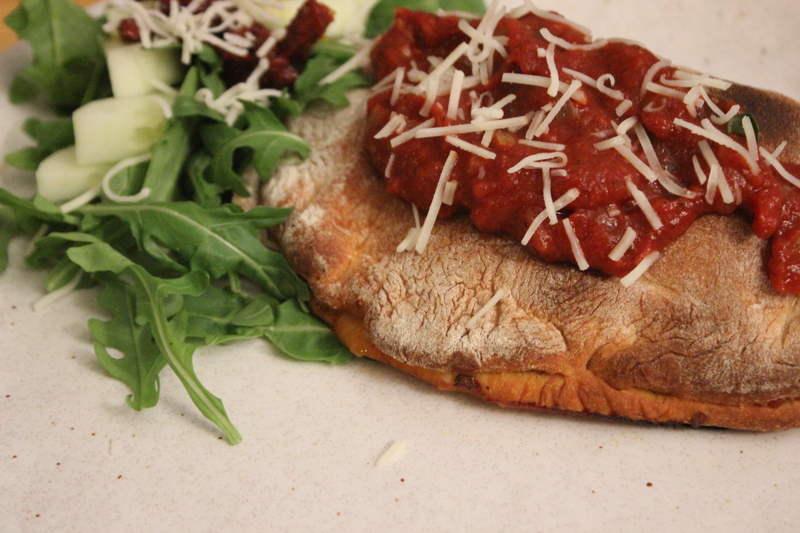 Preheat oven to 450 degrees F. Line two baking sheets with parchment paper and assemble the calzones: top each pizza dough round with a layer of sauce, sausage mixture, a sprinkling of mozzarella, and a small pinch of arugula. Fold over and crimp the edges of the calzone together. Bake at 450 degrees F for 25 minutes and serve with an additional spoonful of sauce (and some salad, let’s keep it healthy!). If you want to freeze any calzones – pull them out at the 15 minute mark, let them cool completely, and then wrap in aluminum foil before placing in a ziplock bag in your freezer. To reheat, bake the frozen calzones at 400 degrees F for 20 minutes. PS: I won’t be posting for the next week or so. There are just TOO MANY baguettes to chow! Even though I am a terrible food blogger and have not cooked one thing for approximately two weeks now (something both my wallet and my waistband are complaining about), my offering to the interwebs today is this simple, delicious pizza the Husband made me over two weeks ago. Better late than never, right? Inspired by Smitten Kitchen, tweaked Chez Nous. “Shave” the asparagus by holding by their (untrimmed) ends against a flat cutting board and running a sharp vegetable peeler across the spear. Repeat until you have a nice little pile of asparagus shavings, and then toss them in a small bowl with olive oil, and a pinch each of salt, pepper, and crushed red pepper. Roll out the pizza dough on a light floured surface; sprinkle a bit of the flour on the bottom of your baking sheet (or pizza stone, if you’re fancy) and then transfer the dough to the sheet. Spread a mixture of the cheeses over the surface, top with asparagus and with cherry tomatoes. Drizzle with a little olive oil if you like, and then pop the pizza in the oven for 10-15 minutes, or until edges are browned and the cheese is bubbly. Top with scallions – the more the merrier – and if you like, fresh herbs, arugula, a poached, egg, whatever your heart desires. This is so simple, and yet, so good. It even feels like it’s good FOR you (which it might be, had we not smothered it in cheese). 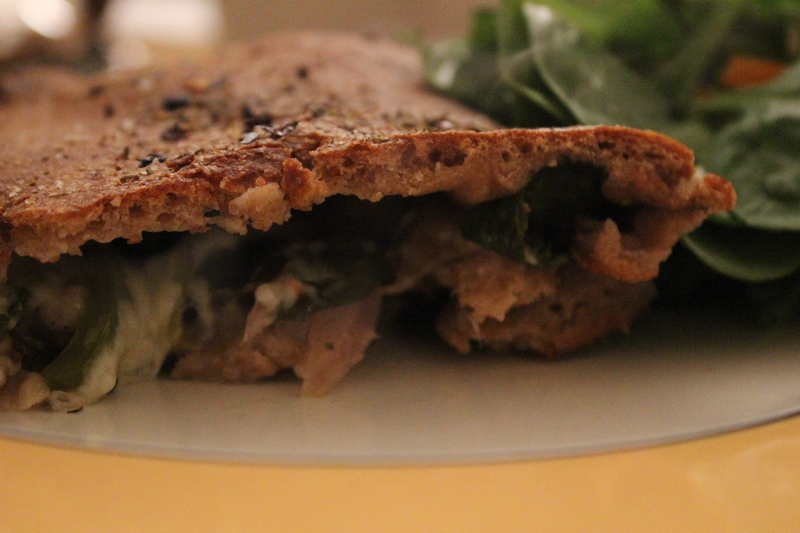 It’s sort of like the scallion situation I described above: the more cheese, the merrier. Obvi. I believe (though I’m not sure, maybe our Italian friend can help out?) the technical term should actually be calzone night, since we serve the sauce on the side (rather than baked within the dough). But this is a Husband Specialty, and apparently the term “stromboli” was invented in Philadelphia, and the Husband is from there. So it’s stromboli night around here. Now, this is certainly not elevated cooking – but if you’re looking for something easy, delicious and filling enough to over-compensate for your gym routine, this is it. This makes enough for two very hungry people or four people with normal-sized stomachs. We fall into the former category. New Year’s resolutions are so 2015.
getting the stromboli party started. store-bought pizza dough (I like the Trader Joe’s whole wheat ball of dough, the Husband, not so much. His recipe, his rules). Working in thin layers (so as not to overstuff the stromboli), start with a sprinkling of mozzarella cheese down the center of the dough; do not spread all the way to the end. Top with your choice of veggies: bell peppers, mushrooms, arugula, onion, mushrooms. If you have a diehard carnivore partner, place a slice of prosciutto or soppressata over the veggies. Top with more mozzarella and a sprinkling of Parmesan. Season with salt, pepper and some crushed reds. Fold in the very ends of the dough towards the center. Fold in both sides so that one side is layered over the other. (The stromboli should resemble a large rectangle or log, see picture above). Brush the top and sides of the log with olive oil and your choice of seasonings and herbs. (We add more s+p, Italian seasoning, and crushed reds). Bake at 425 for ten minutes. 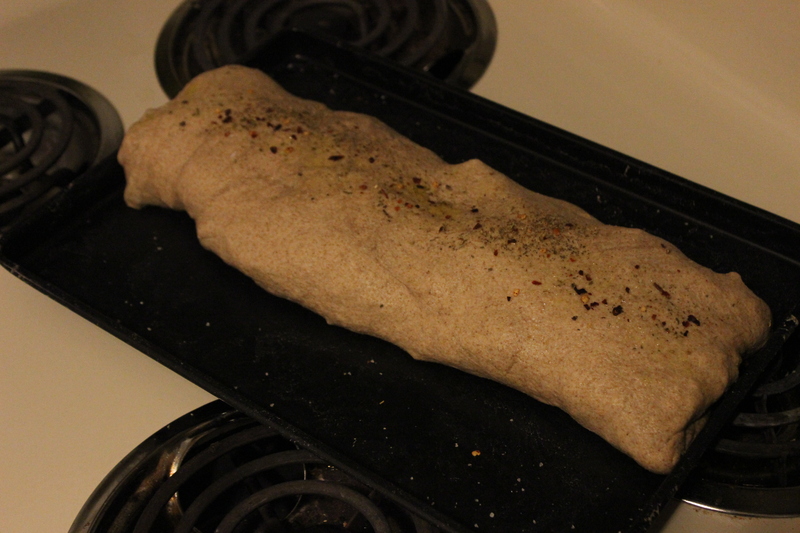 Take the stromboli out and make small cuts into the top of the log, to let some air escape. Pop back in the oven and bake another 10 minutes. Serve with a side salad and a bowl of marinara sauce. The Husband wants everyone to know that “the picture doesn’t do it justice.” My above average-sized stomach agrees. Tuesday night went according to plan – sort of. (And so is life.) We’re fostering a puppy right now and so much of my day-to-day existence has revolved around making sure she isn’t eating our house, peeing everywhere, or otherwise hurting herself. She’s also a bit of a timid little lady, so I took her to a shy and fearful dog class, which was kindly hosted by her rescue organization, Second Hand Hounds. The class started at 6:30pm, so I naively thought that it’d last an hour, I’d be home by 8pm, and I could take charge of dinner then. No such luck. I left the class at 8:30pm and got home at 9pm, thinking that dinner was all over. And then… as I climbed the apartment stairs, delicious smells started wafting through the air. “Could it be,” I wondered in my starved stupor. I steadily mounted the last stairs, opened the apartment door, and gasped in excitement: the pizza had been prepared (by my kind and loving husband). Seriously, there is nothing better than coming home to have a freshly cooked pizza waiting for you. So here is our favorite pizza to make at home. It’s nothing special, but it’s oh so delicious and oh so easy and enjoyable on a night where you don’t really have much gas left in the tank and you want a cheap and simple meal. 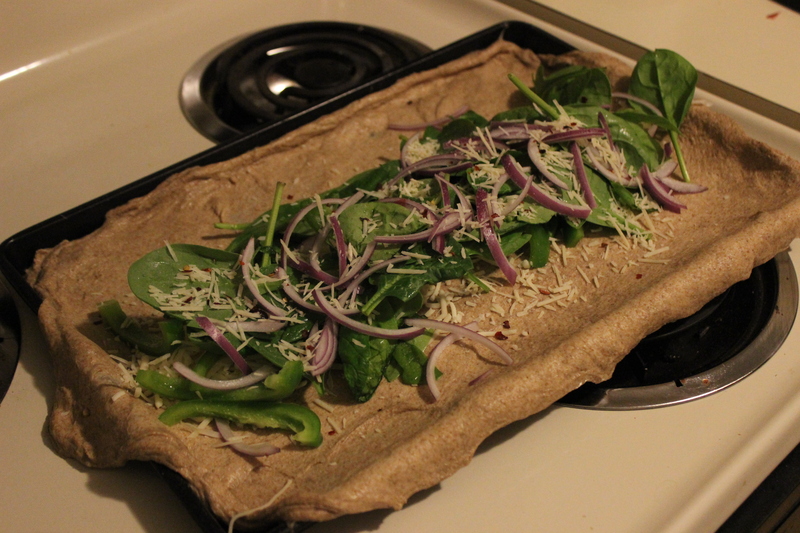 Prepared pizza dough (when I called this pizza “homemade,” I stretched the truth a little bit). We’ve bought our dough at Whole Foods, our local food coop, and Trader Joes. Your local pizza place may have dough for purchase as well. 1. Preheat the oven to 350 degrees (or follow whatever cooking directions your dough provides). 2. Roll out the dough on a baking pan – feel free to spray the pan with non-stick spray first. 3. Spread the pesto on the dough, place the salami on the pizza, and then cut up the mozzarella into slices and arrange on the pie. 4. Stick in the oven and let that baby cook until the crust is where you want it -maybe around 20 minutes. Totally easy and totally yummy. To make ourselves feel better about having pizza, we also pulled together a quick salad. The story behind this salad: for the longest time, I’ve been going to restaurants and ordering an arugula salad – it’s always super simple and I feel clean and wholesome and pretty while I eat it (before diving into whatever pasta deliciousness I’ve also willed to appear on the table). But then I go home and forget about arugula until the next time I go to a restaurant and run through the same cycle and spend another eight bucks on something I could have easily made myself. Recently, I realized that I was being stupendously silly and set out to rectify the situation. And here it is: the best (and easiest ) salad ever.